Polyurethane concrete raising, also called Poly lift or Poly lifting, achieves the same leveling results as traditional mudjacking with a lightweight material that requires smaller and fewer injection holes. A cost-effective alternative to level concrete surfaces, which avoids replacement and can usually be done for less than half the cost of pouring new concrete. However, the savings may be even greater since when concrete raising, the costs of demolition, removal, and landscaping are eliminated. Polyurethane leveling saves time, money and disruption to businesses. Most Poly Urethane projects can be completed quickly and economically with minimal disruption, and are ready for use the same day. Whether you have a project you need a flat, level surface for a Plant floor, municipal road or highway, or with warehouse floor raising and leveling, we are specialists in large commercial applications. The equipment is contained in a truck or trailer, and has a sufficient length of hose to accommodate your needs. The equipment remains parked while the polyurethane and Poly Lift crew pulls out enough hose to reach the area being repaired. Polyurethane foam, a high density material, is injected under the slab filling voids and raising it to the correct level. After the Polyurethane injection is completed the hole is patched with cement resulting in a level surface. Customers can still access your main entrance as our very courteous crew will make sure traffic flow is not interrupted. 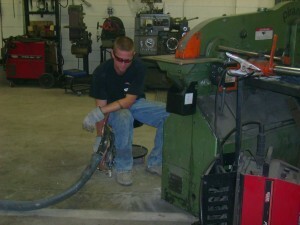 Most jobs can be done in one day, large jobs may take longer, and your operations can continue while we work. Typically 1-866-SLABJACK can work around your stock or machinery, working with your schedule. Experienced crews have knowledge of the unique climate and soils throughout the Pacific Northwest region for polyurethane concrete raising in Boise, Spokane, Seattle, and Portland. Settled concrete is commonly a result of poor soil conditions bellow a slab. Because of this Polyurethane has become a popular repair method because the high density material is so lightweight it will not further burden the already weak soil. Mudjacking uses a sand based material that is infused with portland cement. This slurry is hydraulically pumped under the slab to fill voids and raise the concrete. Mudjacking material weighs on average 100 lbs per cubic foot. 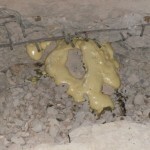 Polyurethane Concrete Raising uses a foam material that is injected under the slab. When the components of this material are mixed a reaction causes the material to expand. This expanded foam fills any voids and raises concrete. This material will never lose density. After it is installed it is permanent and weighs about 2 lbs per cubic foot. After the concrete has been raised the only visible evidence that the slab has been repaired is the holes. For this reason Polyurethane has gained HUGE popularity because of the nearly invisible 5/8 inch holes that remain after the job is completed. Mudjacking involves drilling a series of 1 inch holes in a slab of concrete so the material can be pumped under the settled slab. 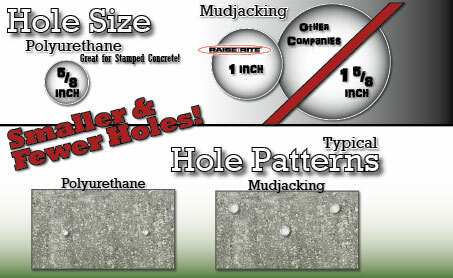 Polyurethane Concrete Raising drills a nearly invisible 5/8 inch hole and the process calls for considerably fewer holes than traditional mudjacking. Lightweight material, fewer holes, and smaller holes give polyurethane a clear advantage over mudjacking material. Perfect for joint stabilization this material travels along a void filing and stabilizing the concrete to avoid vibrations and rocking. High Density material is a lightweight material. It is injected as a liquid and sets up into a foam material. After 15 seconds it will reach its final volume, after curing it will never lose its density. This material is vulnerable to sunlight which can damage the material structure. With the application being under concrete it is not exposed to sunlight therefore never losing density. The polyurethane equipment is contained in a truck or trailer, and has a sufficient length of hose to accommodate your needs. The process of void filling and raising a concrete slab is the same as traditional mudjacking. Polyurethane expands versus the pressure of pumping in traditional mudjacking material. Because of the characteristics of the material and how it is delivered, polyurethane can cover a larger area in less time. To learn more about 1-866-SLABJACK High Density Polyurethane please call 866-752-2522. 1-866-SLABJACK has a variety of Polyurethane Materials for different applications. Designed specifically for large slabs, small slabs, void fills, and soil stabilization 1-866-SLABJACK materials react and expand differently for the desired end result. 1-866-SLABJACK has become a premier provider for polyurethane concrete lifting and void filling. No job is too big for the professionals! They completed their work on time and the driveway looks great. They lifted a bigger area as well to be sure both side of the driveway looked right. Very nice work.